Twin satellites that will monitor Earth's water cycle are scheduled to launch from Vandenberg Air Force Base in Central California on Tuesday, May 22, in a unique rideshare arrangement. 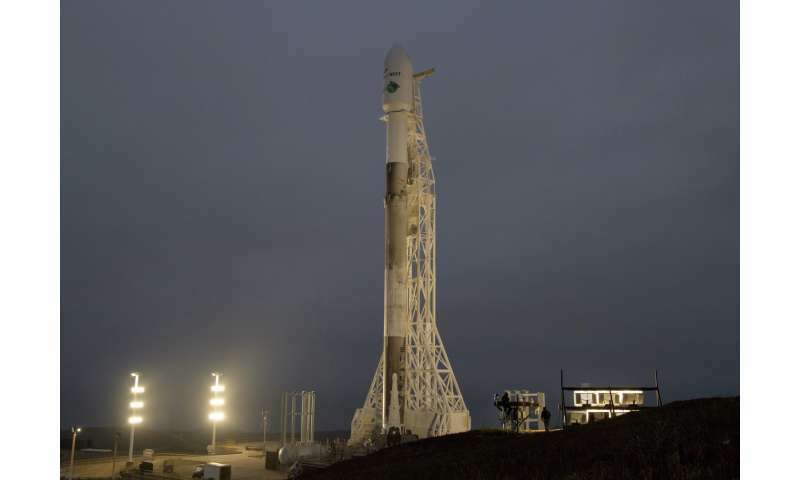 The two Gravity Recovery and Climate Experiment Follow-On mission (GRACE-FO) spacecraft will join five Iridium NEXT communications satellites as the payload on a SpaceX Falcon 9 rocket. Liftoff from Vandenberg's Space Launch Complex 4E is targeted for 12:47 p.m. PDT (3:47 p.m. EDT), with an instantaneous launch window. If needed, an additional launch opportunity is available on Wednesday, May 23. GRACE-FO, a collaborative mission of NASA and the German Research Centre for Geosciences (GFZ), continues the work of the original GRACE mission in observing the movement of water and other mass around our planet by tracking the changing pull of gravity very precisely. On liftoff, the Falcon 9 first-stage engines will burn for approximately 2 minutes and 45 seconds before shutting down at main engine cutoff (MECO). The Falcon 9's first and second stages will separate seconds later. Then, the second-stage engine will ignite for the first time (SES1) and burn until the vehicle reaches the altitude of the injection orbit, 305 miles (490 kilometers). While this burn is going on, the payload fairing—the launch vehicle's nose cone—will separate into two halves like a clamshell and fall away. When the rocket's second stage has completed its ascent to the injection orbit altitude, it will pitch down (its nose points down) 30 degrees and roll so that one of the twin GRACE-FO satellites is facing down, toward Earth, and the other is facing up, toward space. Then the second stage engine will cut off (SECO). About 10 minutes after liftoff, a separation system on the second stage will deploy the GRACE-FO satellites. Separation will occur over the Pacific Ocean at about 17.5 degrees North latitude, 122.6 degrees West longitude. The first opportunity to receive data from the spacecraft will occur at NASA's tracking station at McMurdo, Antarctica, about 23 minutes after separation. At deployment, the GRACE-FO satellites will be released from their payload dispenser in opposite directions at a rate of 0.8 to 1 foot per second each (0.25 to 0.30 meters). The Earth-facing satellite will be pushed down into a lower orbit that is faster on average, while the space-facing satellite will be pushed up into a higher orbit that is slower on average. For the first few days after launch, the lower, faster satellite will pull slowly ahead of the other until the two satellites are approximately 137 miles (220 kilometers) apart—the optimal separation distance for science operations. Then the lower, leading satellite will be raised into the same orbit as the higher, trailing satellite. This maneuver will keep the two spacecraft from continuing to drift farther apart, so that the two continue to orbit on the same track, one following the other.